10-12 oz. shredded, UN-sweetened coconut will make one very thick and fluffy crust, as shown above. Just 8 oz. will make a thinner, normal crust suitable for coconut banana cream pie or snowballs (aka crack balls). Whole Foods-type supermarkets carry Let’s Do Organic and other brands. One 8 oz. bag holds 2 2/3 cups. 1.) Preheat the oven to 350°F. 2.) Melt the butter on low in a small saucepan. 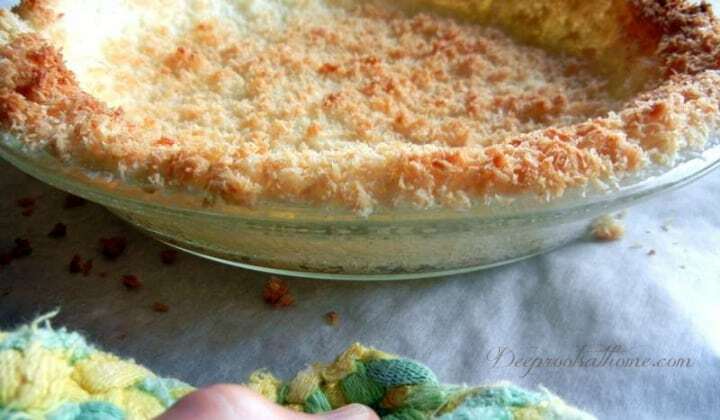 In a medium-sized bowl, thoroughly mix the shredded coconut with the melted butter. 3.) Place a 9-inch pie plate on a parchment-lined rimmed baking sheet. Press coconut mixture into bottom and up sides of pan to form crust, leaving top edges loose and fluffy. No need to grease the pie plate. 4.) Place a foil ring over the edges to prevent burning. Bake until center begins to brown, 10 to 15 minutes; remove foil and bake until edges are browned, 4 to 5 minutes more. Use your timer and set it for a couple of minutes less than you think you’ll need to brown. Keep an eye out from that point on and you can produce the perfectly browned, golden edge! Voila! A lovely golden brown that holds together under your filling! YUM! The key lime sounds divine! Are you willing to share the recipe? My mouth is watering looking at the picture! Thanks for sharing the crust recipe, I will give this a try! I love coconut so I know I would like this crust. A coconut cream pie would be good in this crust too. I guess sweet potato pie is my favorite for Thanksgiving. PRAY you are doing well. GOD BLESS!!! Would LOVE your KEY LIME PIE recipe! It is also gluten and egg free! 1/3 – 1/2 cup agave nectar (depending on preferred sweetness) – I will be using raw honey on this one since it what we have on hand. you could also use Florida crystals or Rapadura or maple syrup. Add all filling ingredients to a blender and blend on high (or liquify) until creamy and smooth. Taste and adjust flavor as needed, adding more lime zest/juice for more tart, or more agave for added sweetness. Freeze for 4-6 hours or until firm. Remove from the freezer for 10-15 minutes to thaw before serving. If you make these as little minis in cupcake holders, the wrappers come away pretty clean without much fuss, which I like! Thanks for this recipe! Has anyone tried it with a filling that needs to be baked? After filled, how long of a baking time? I had this pie at my niece’s shower a few weeks ago and it was delicious!!! If I knew it would have agreed with me so well, I would have gone back for a second piece! Grace, peace, and joy to you! 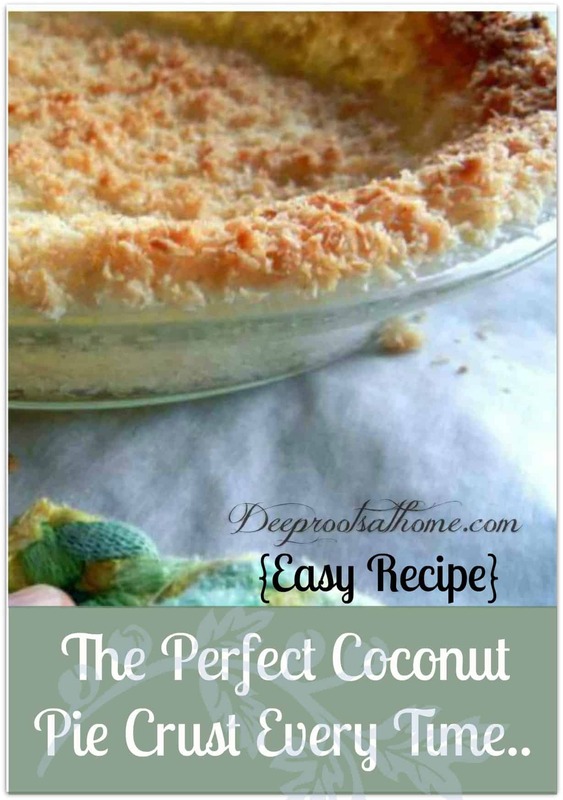 Oh my, the coconut crust looks so delicious! I’m going to have to try that this weekend. Goodman has to watch his sweets so we only have them now and then and never during the week. (That’s not to say I don’t have a li’l stash somewhere though, it’s just not official for his well-being.) 😉 Thank you for sharing the recipe. Yes! Toni #2 surprised me and made me think you had changed something! Ha! You aren’t the only one who has a stash, but mine is getting healthier lately. I’ve been craving dates, and so I cut out the pit with a slice down the side, salt it, and stuff it with as many as 5-6 almonds! it is just the best snack and I don’t feel terrible about it later! Maybe try it and let me know what you think! God wrap you up in warm comfort, mercy, grace, and peace, sweet friend! Jacqueline…This looks so delish! I am definitely going to make it at home. Maybe this weekend! 🙂 Thank you friend. Sending you frosty hugs, dear friend! This crust looks wonderful, but I wonder if it is suitable for a pie that must be baked. Yes, bake the crust first, fill it and then bake again. Has anyone tried this?I am wondering if it will hold up or fome apart. please, can the crust. be made with margarine instead of butter? I have not made it with margarine, so I hesitate to say so. Butter is so much better for you. but you might try it and watch that it in the oven to make sure it doesn’t smoke or burn. Good luck!